The Downey Kiwanis Foundation has donated $50,000 to the Downey Unified School District for a new computer lab at East Middle School. 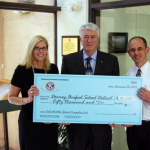 The donation was made at a presentation ceremony Jan. 25. “We are so grateful to the Downey Kiwanis,” said Brent Shubin, principal at East Middle School. “Our computer lab is now up to date with the latest technology and it is being used all the time. Downey Kiwanis Club was established in 1924. Its charitable foundation contributes to worthy projects that serve the local community.